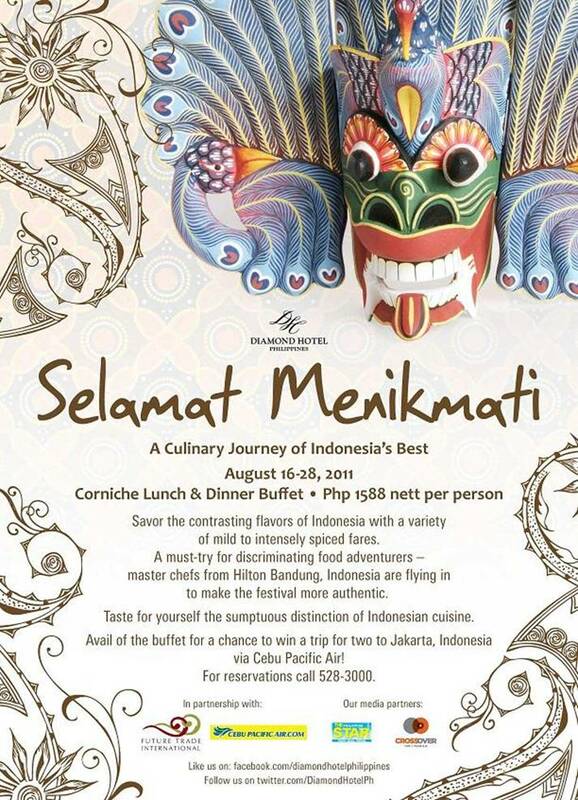 Selamat Menikmati: A Culinary Journey of Indonesia's Best at Corniche, Diamond Hotel. For a limited time, from August 16 - 28, Diamond Hotel Philippines features the vast varieties of Indonesia's cuisine as it continues its remarkable series of food festivals. And in celebration of Indonesia's national day, this culinary feast showcases authentic culinary masterpieces prepared by master chefs specially flown in from Bandung, Indonesia to give you that authentic taste of Indonesia. 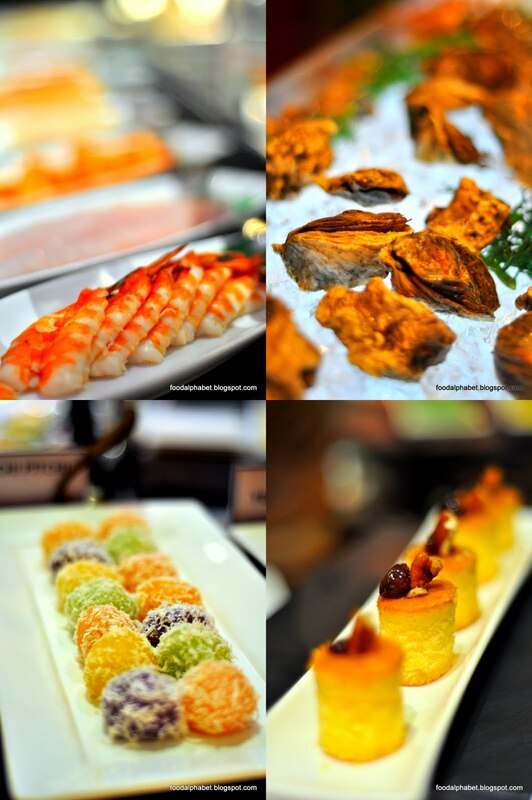 Three of Hilton Bandung's most talented Indonesian chefs recreate their nation's flavors at the Corniche Buffet. Headed by Sous Chef Ovan Prahoro, a master chef with an extensive background in cooking not only from his native land but also from other countries such as Riyadh, Dubai and Bahrain, also joined by Chef de Partie Asep Marthy and Chef de Partie Agus Setiadi. They are tasked the challenge of giving you the best of Indonesia's dishes. Gado Gado (Mixed Vegetables with peanut sauce) Much like our pinakbet but with Kare-Kare paste... yummy!!! Mie Tektek (Stir-fried Noodle ) with eggs and vegetables, I love how the noodles tasted, just my type, hay I already missed the ones I had in Bali, as always a treat to partake. a traditional Indonesian cuisine that may have similarities with our dishes from Bicol which loves Coconut and Gata. 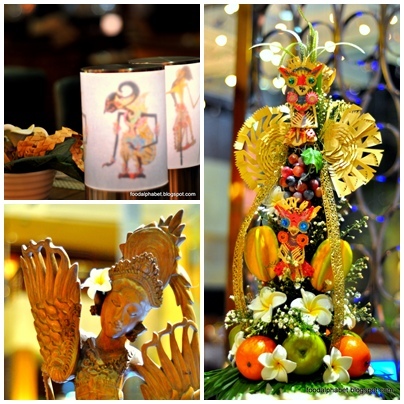 They served on the Carving : Kambing Guling (Lamb Roast) together with other favorites such as US Prime Rib Roast, Roast Duck, Lechon Kawali and Soy Chicken, they will definitely wet your appetite. 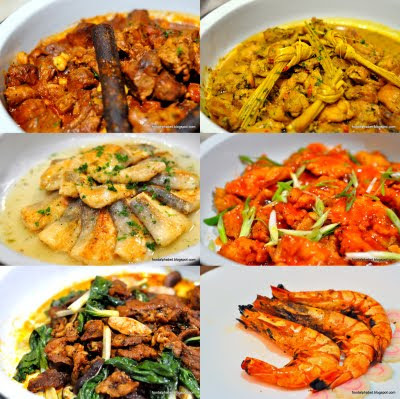 Other than the delectable authentic Indonesian cuisine, they are also mixed with the best of Asia's cuisine with their dimsums, Chinese soups, and other mouth-watering dishes. It was a feast not just for the eyes but also of the appetite. After those sumptuous dishes comes one of favorites and here we go with desserts, the classic Indonesian desserts which you may find familiar with some of our own. two of my favorites, on the left is Lapis Surabaya (layered sponge cake with strawberry jam) and on the right Urap Jagung Manis (Sweet corn with grated coconut), so similar with our local "Binatog"
Wow they look so nice and carefully prepared and yes they taste good as well. What a treat, some servers wore the classic Hindu wear of Indonesians, makes me feel like I'm in Bali, Indonesia again for the moment. Enjoy the bountiful buffet and feel refreshed and rejuvenated with the sights of Corniche. Sous Chef Ova Prahoro was on hand to express his delight over our visit. 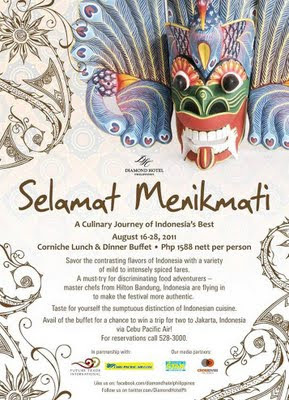 But this does not end here, from Aug. 16 to Aug. 28, 2011, satisfy your Indonesian cravings for only P1,588 nett per person. This much anticipated food festival also gives each guest a chance to win roundtrip tickets for two to Jakarta, Indonesia, courtesy of Cebu Pacific Air! The food festival was made possible in partnership with Future Trade International and Cebu Pacific Air and in cooperation with media partners 105.1 FM Crossover and The Philippine Star. Thank you Diamond Hotel and Mr. Spanky for inviting us over. Diamond Hotel Philippines is located at Roxas Boulevard corner Dr. J. Quintos St. Manila. For inquiries and reservations, please call Corniche at (632)528-3000 local 1121. Please visit www.diamondhotel.com and follow them on Facebook at http://www.facebook.com/diamondhotelphilippines and Twitter at http://twitter.com/DiamondHotelPh, for more updates and offerings.